Millions of women and girls around the world turn to domestic work in order to provide for themselves and their families. Instead of guaranteeing their ability to work with dignity and free of violence, governments have systematically denied them key labor protections extended to other workers. Domestic workers, often making extraordinary sacrifices to support their families, are among the most exploited and abused workers in the world. I went to my first flamenco show since I arrived in Spain, called "Algo más que flamenco", playing at El Teatro Arlequín. The spectacle is meant to showcase the different regional dances of Spain, focusing on flamenco primarily but also giving us glimpses of the Zarzuela, Muñeira, Aurresku, etc. While watching the dancers I couldn´t help be reminded to Indian Kathak dance. Some of the turns, hand movements and the use of feet for rythym are so strikingly similiar. Actually, flamenco has Indian origins as the gypsies, or Rom people, are said to have originated from what is now Rajasthan. Of course, then flamenco received a melting pot of influences from all the different cultures that inhabited Spain. Speaking of which, today Madrid´s summer event series "verano en la calle" had a group called Musafir, gitanos de Rajasthan that played in the park. Sad I missed it. Here you have some clips of Flamenco and Kathak. I love the last video in particular. I am including links to two articles from the Kuwait Times this week on different incidences of abuse against domestic workers in Kuwait. In other news, a proposal to Parliament to pay vulnerable domestic workers, whose salaries are often denied, directly into their bank accounts. This would serve as a positive step to further regulate wages and ensure compliance with salary payments. Let us hope it passes, enforcement is another issue. KUWAIT: An Egyptian man killed his Filipina wife in a salon in Jabriya yesterday, after she allegedly did not return home for the past four days. The killer came to the women's salon where the victim worked and killed her by stabbing her in the heart. He then ran away, leaving his shoe behind. Police are hunting for the killer. Separately, detectives apprehended the torturers and killers of a Filipina whose body was found near farm buildings in Kabd - a Kuwaiti husband and wife who employed her as a domestic worker. The wife admitted during questioning that she tortured the woman daily with her husband's full knowledge and agreement. When the woman fell unconscious after yet more abuse, the couple panicked and, rather than taking her to hospital, they took her to Kabd, threw her out of their car and ran over her before fleeing the scene. re the Gulf War in 1990 - at first working for an Egyptian family. During the war, however, she ran away with her Egyptian sponsor to Jordan. At the peak of the war, she was told to go back with her family to Sri Lanka and wait there until the war is over. She did return to Sri Lanka, but the promise of Egyptian sponsor who would take her back to Kuwait, never materialized. Struggling to accomplish her dream of buying a house, she embarked on another overseas challenge. She obtained a new visa for Kuwait job. This time, she ended up working for whom she calls 'merciless employers' in Jahra. Between stifled sobs, Kamala narrated her ordeal to the Kuwait Times through an interpreter as she could only communicate in Arabic and her native Sinhala language. Three days after arriving from Sri Lanka, I almost gave up. They beat me; I sustained bruises, my head was also hit. They told me to continue working with them. I cried hard every day but nobody listened. I stopped crying and accepted my fate," Kamala narrated her story. She asked for her salary, a month after her arrival, "They asked me why I needed money. For what? I told them because I was working to earn money. But they mocked me," she said. "From then on, the same story was repeated every month. I would ask for my salary but I would never get any. They said they have no money. I really believed that since they did not have any air-conditioning facilities installed at home. I would sleep on the floor at night. I would place wet towel on their beds for cooling. I did the same to the place where I would sleep," she said. These living conditions changed after a few years, she recalled. After two years, I tried to escape. I went out, hid in the car with my bag. But when I tried to cross the street, they saw me run. They quickly grabbed me, beat me up again and locked me inside the room for one day. They warned me against trying to escape again. They said they would kill me. So from then on, I didn't even try to escape anymore," she sobbed. She explained that she was forced to obey strict orders. "I also stopped asking for money because I was really afraid," she said. Kamala is not aware of the number of years that have elapsed since being 'employed' with her sponsor. She has lost count of days and months and remembers having tried to place an unsuccessful phone call to an acquaintance in her home town of Avissawela. Kamala is partially literate, she can count and read numbers. A few months ago, a compatriot named Guita arrived at her sponsor's home to work as a domestic helper. She suffered under the same appalling conditions. Also, whenever Guita inquired about Kamala not being allowed to leave on vacation, the sponsor would lie, "They told Guita that I don't like to leave their home. They told her that I was sent to the airport many times but I would refuse to board a plane. But those are lies. I was never allowed to go to the airport; not even once," she told Kuwait Times. So when Guita planned to escape, I asked her not to leave me alone," she said. They finally snatched a life-changing opportunity on June 26, "We walked out and hid between passing cars so as to avoid being caught by our sponsor. When we reached a co-operative society, Guita asked me to hide behind a bush. The plan was to hire a taxi that would take us to the embassy. I waited for long until I gave up and hired one on my own. I thought that our employer had caught her," she said. But an hour later, Guita arrived at the Sri Lankan embassy, pleading with authorities to help Kamala. She was oblivious to the fact that Kamala was already there. Both were reunited at the embassy's premises. At the time of writing this, Kamala is still unaware of the fact that her mother whom she loved dearly had passed away almost a year ago. The information was relayed to Kuwait Times by a Sri Lankan embassy official who had contacted Kamala's family. She looks forward to returning to her family - to be with her mother, two brothers and two sisters. She acknowledged that her dream to build a home for her mother was never fulfilled. The Sri Lankan Ambassador to Kuwait Sarath Dissanayake has promised to resort to proper legal channels to resolve Kamala's issue. 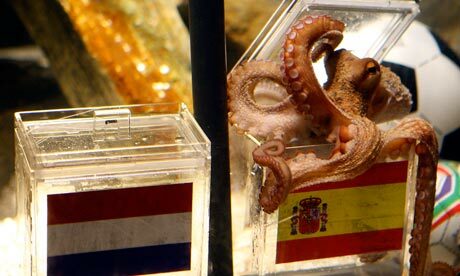 In what may prove to be the biggest transfer story this summer, negotiations have begun to bring Paul the psychic octopus to Madrid after he correctly predicted Spain's World Cup final victory. Madrid's Zoo Aquarium says it is prepared to trump any other offer Germany's Oberhausen Sea Life Centre receives for Paul, certain that the world's most famous cephalopod will attract thousands of visitors. At present no cash is on the table, and the zoo says it is trying to negotiate an exchange of animals. Sounding more like the president of Real Madrid than a zookeeper, a spokesman said he was confident that Paul would be in Madrid within a few days. Madrid was prepared to offer Oberhausen "whatever they demand" to complete the deal — suggesting that this will be a cash-plus-animal transfer. He added that Paul, named after a German children's book by Boy Lornsen, would be treated "with tender loving care" because of his national treasure status in Spain. Paul correctly predicted the outcome of all seven of Germany's World Cup matches, as well as the final between Spain and Holland. This was an improvement on his record for the 2008 Eurocopa, in which he correctly predicted four out of six of Germany's games. During the World Cup, Paul became a media phenomenon, with his final predictions screened live on television. He also became the world's third most popular Twitter trend during the competition, out-doing both Shakira and Cristiano Ronaldo with 141 hours of trending. A Brazilian company has developed an iPhone app based on Paul's performance, allowing users to consult the octopus to help them make decisions. The Ask the Octopus app lets users ask 50-50 questions, to which a cartoon of Paul chooses an answer. Activists of the Anti-Racism Movement in Lebanon took this video. ARM is a campaign initiated by IndyACT aiming at exposing, shaming and blaming all wrongs perpetrated against Migrant Domestic Workers (MDWs) in Lebanon. Being in Madrid has been exhilarating these past days, to say the least. The one thing that has been the most enjoyable has been seeing the hysteria of veneration for Paul "The Oracle" Octopus, known in Spain as "Pulpo Paul". Cow is to India what Octopus is to Spain now. The Guardian: "World Cup 2010: Spain's success puts nationalists in the shade"
They call it "the red effect". It has spread down Spanish streets on the torsos of hundreds of thousands of fans wearing the shirt of the national soccer team, La Roja or "The Red", and threatens to over-run even the most obdurately separatist corners of the country. On nights when the team notches up another World Cup victory it turns into a musical chant: "I am Spanish! Spanish! Spanish!" they shout joyfully. "I am Spanish! Spanish! Spanish!" Spaniards cannot recall an outpouring of national pride similar to that provoked by the country's first-ever appearance in the World Cup final today. "Not since the Spanish civil war have there been so many flags in the streets," El País newspaper reported as Madrid prepared for an all-night party if La Roja beat Holland in South Africa this evening. Indeed, Spain's red and gold flag still reminds some people of the civil war of the 1930s, more particularly, of the 36-year dictatorship of Francisco Franco, leader of the pro-fascist Nationalists, that followed it. Few countries in Europe, except Germany, have such an instinctive mistrust of patriotism. Such an outpouring of national pride also raises challenging questions about Spain's vision of itself. This is a "nation of nations" according to some, who see Catalonia and the Basque country as unrecognised nations which, like Scotland, deserve their own football teams. Spain oppresses other nations, according to separatists, including to the Basque terror group Eta – which exacts its revenge in blood. The country's constitutional court disagrees. "Our constitution recognises no nation but Spain," it affirmed on Friday in a stern rebuke to Catalans who hoped a new autonomy statute might formally allow them to be known as a nation within Spain. Every now and then, a golden nugget of a freak article somehow manages to get published by BBC News. Scouting these news of the weird is like finding the toy in the cereal box for me. Behold one of the examples of beautiful journalism from last week. Maggots falling from an overhead luggage locker have forced a US Airways flight to return to the gate at Atlanta airport. "Bugs just began to fall out of the overhead compartment" causing panic on board, passenger Desiree Harrell was quoted as saying by Associated Press. All the passengers were then asked to get off so crews could clean the plane. The airline said a container of spoiled meat brought on by a passenger caused the delay of the flight to Charlotte. Donna Adamo, a passenger on board flight 1537, said she first noticed a couple of flies when she got to her seat on Monday but did not pay much attention to that. As the plane was taxiing, she said she heard a passenger behind her causing a commotion and refusing to take her seat. "Then I heard the word 'maggot' and that kind of got everybody creeped out," Ms Adamo told AP. Passengers were asked to get off because of a "minor emergency"
"All of a sudden, I felt somebody flick the back of my hair and on the front of me came a maggot, which I flicked off me. But she said she "felt like they were crawling all over me because it only takes one maggot to upset your world". "And as they're telling us to stay calm and seated, I see a maggot looking back at me and I'm thinking, 'These are anaerobic, flesh-eating larvae that the flight attendants don't have to sit with.'" Ms Adamo said the pilot then announced that he had to return to the gate because of a "minor emergency on board". The plane was cleaned and then continued on to Charlotte. However, the unnamed passenger who brought the spoiled meat in a carry-on bag was put on another flight, US Airways spokesman Todd Lehmacher said. It was not immediately clear how the passenger managed to take the meat on board. Who is this woman with an afinity for musical instruments? What is she singing about? Any leads?